I’m weird. Who else do you know who yearns for a big green compost cart from the garbage company? Here in the wilds of South Beach, just outside Newport City limits, we watched our city friends and neighbors getting carts, but not here. I called. I chose to let them pile up in the yard, with vague plans to buy a burn barrel and fill the neighborhood with smoke and ashes like some of my neighbors do. But finally, finally, the compost carts came to our neighborhood. Except my street, all four houses. I called. It was like waiting for Santa at Christmas. I looked out the window every five minutes until finally, a little after noon, there it was, a 96-gallon monstrosity that dwarfed my 65-gallon recycle cart and my 24-gallon garbage/landfill cart. I couldn’t wait to start piling stuff inside. Soon my yard would be so clean and neat. As soon as the rain stopped gushing down, I’d get to work. 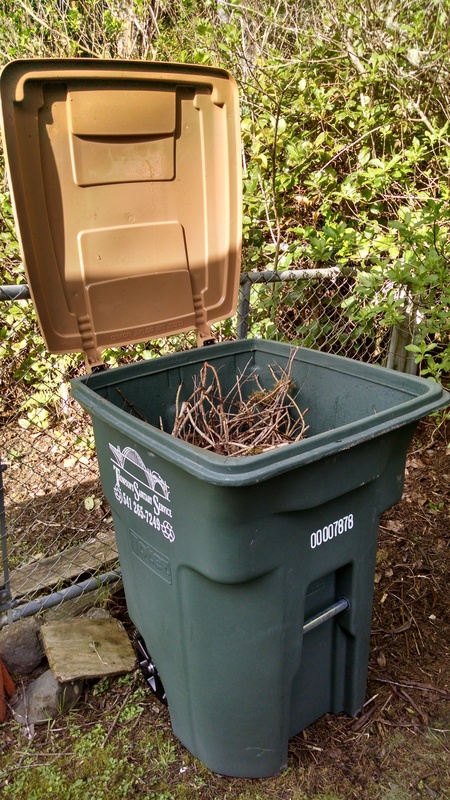 Saturday morning, I put on my sweats and garden gloves, said hello to my pristine compost cart and started piling in branches, mostly out-of-control wild blackberry vines I had trimmed away from the house. Then I moved to the big pile that has been composting naturally on the side of the house for years and started shoveling in branches, dried-out hydrangea blooms, weeds and grass. The trouble arose when I decided to move my three-quarters-full, chest-high cart without shutting the lid. Somehow, it became unbalanced and tipped forward. At the same time, the lid clopped me in the face and I fell in, banging my shoulder hard and my knee almost as hard. Down we went, me and the cart full of thorny branches. Bang! Crap! Ow! I was in the cart. Slowly, I pulled myself out, hoping I wasn’t broken. I could feel my pulse in my cheek, an ache in my knee, a twisted-out-of-whack feeling in my back, and serious pain in my shoulder. Not good for a musician who would be playing the piano at church in a few hours. Gingerly I moved my limbs and determined that I was not broken, only bruised. I thanked God. I pulled up my cart, dug my gloves out from under the greenery, and gently shut the lid. Okay, cart, you win this one, but I’ll get you on Thursday, when I stuff in more grass, add my grapefruit rinds, tea bags, and chicken bones and haul you to the curb with all the other carts. Then the garbage truck will lift you up, dump you out, and smack you back to the ground while I relax on my loveseat with the dog. Today I’m fine except for a sore but functional shoulder. Sometimes I feel like a very small woman trying to maintain a very large home. A condo somewhere with other old widows and a staff of professional maintenance people is starting to look more appealing every day. Also, it occurs to me that someday I will be compost, too. But not yet. I have to mow the lawn. And yes, I do get the irony of trying to control what grows on a one-third acre parcel in the middle of the forest.